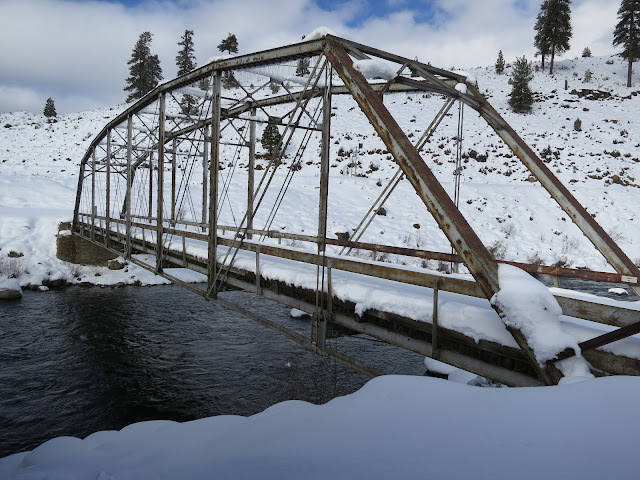 Continuing east through the snow we arrived at Hirschdale Road north of I-80 where a new reinforced concrete box girder bridge crosses the Truckee River and an old truss bridge remains in place as a pedestrian bridge. According to the reliable Bridgehunter the old bridge is a Parker pin-connected through truss with a wooden deck. The 136 ft long single span bridge is only 14 ft wide and the Bridgehunter didn't provide a construction date for the bridge. I was concerned about this bridge because a blog said that two deteriorated Hirschdale Road Bridges over the Truckee River and the Union Pacific Railroad might be torn down to build a bicycle trail from Tahoe City to Pyramid Lake. However, when I read more closely, I discovered they were talking about a pair of 1928 vintage T-girder bridges south of I-80 and that the bridges were probably in good enough shape for bicycle traffic. Nevada County, California Bridges: Hirschdale Road Bridge across the Truckee River by Mark Yashinsky is licensed under a Creative Commons Attribution-NonCommercial-ShareAlike 3.0 License.